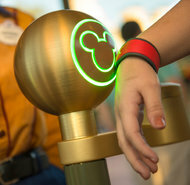 The initiative is part of a broader effort, estimated by analysts to cost between $800 million and $1 billion, to make visiting Disney parks less daunting and more amenable to modern consumer behavior. Disney is betting that happier guests will spend more money . . .
For a more radical take, check out this AlterNet piece. However you hold it up to the light, this is Goofy.